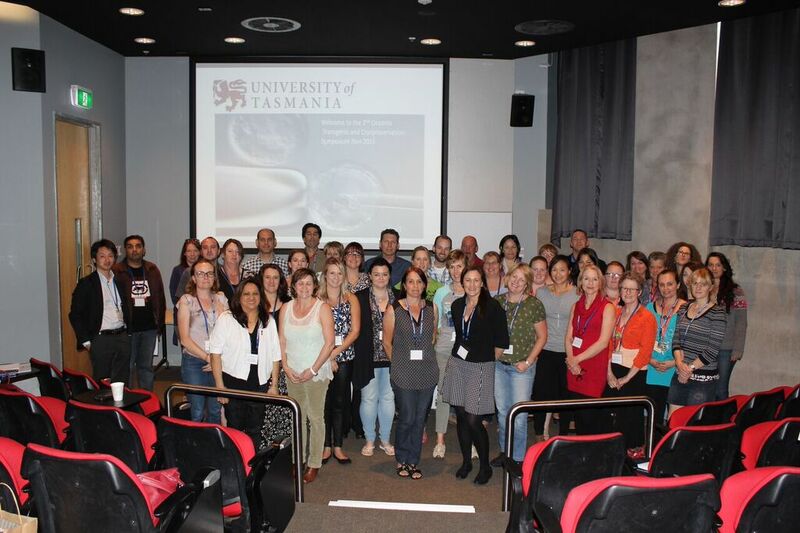 The 2nd Oceania Transgenic Technology and Cryopreservation Symposium was held at the University of Tasmania’s Medical Sciences Precinct, Hobart, Australia on the 18th-19th of November, 2015. The meeting was a great success with for 48 participants from 23 research institutions across Australia, New Zealand, Japan and the USA and with the support of 9 sponsoring companies. The Organising Committee comprised of: Paul Scowen-chair and host (UTAS), Elizabeth Williams (University of Queensland Biological Resources), Kevin Taylor (Australian BioResources,) Irma Villaflor (Children’s Medical Research Institute, Westmead), Tanya Templeton (Australian Phenomics Network, Monash) and Karen Brennan (Victor Chang Cardiac Research Institute). Once again, it provided an opportunity for networking, for keeping up to date with the latest developments in transgenic technologies and for sharing knowledge through expertise, round table discussions and hands-on experience. The symposium began with a warm welcome from the host, Paul Scowen, and quickly moved on, beginning with a session of talks related to assisted reproduction techniques and their applications. Dr. Toru Takeo (Kumamoto University, Japan) , started by showing that ‘ultra-ovulation’ of female mice through the administration of a novel anti-serum (soon available as a commercial product) allows for consistent collection of a large number of usable oocytes from a single mouse. Combined with the IVF media products developed by the same group, mouse IVF techniques are now even further enhanced. Elizabeth Williams (UQBR) demonstrated that the CARD embryo vitrification technique can be adapted to use either straws or vials as the cryostorage vessel, allowing facilities to update their freezing techniques without having to change their liquid nitrogen storage equipment. An entertaining presentation was delivered by Prof. John McLaughlin, showing that cryovials can be easily converted with the new ‘Cryofork spatula’ to allow for easy vitrification of embryos in small media volumes. Rodrick Rupan described the challenges faced in rederiving immunodeficient colonies and how they were overcome. Continuing the rederivation and IVF theme, Mary-anne Migotto explained how UQBR have used IVF techniques to offer a rapid and large scale rederivation service. Tanya Templeton expanded upon her talk from the first Oceania symposium, giving an update on developments in ICSI technique and use of piezo methodology at Monash University. 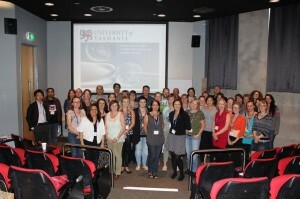 The session concluded with Julie Stanley’s talk on sperm cryopreservation at WEHI. The second session covered various aspects of rodent health screening, biosecurity, monitoring, risk assessment and challenges when dealing with genetically modified mice models. Dr Trasti presented key concepts for a rodent sentinel program, establishing exclusion criteria, sample collection, interpretation of report and preparation of an action plan in case of an outbreak situation. Dr Villaflor discussed recommendations on which pathogens to monitor, issues with working with humanized immune deficient mice, quality control system and her experiences with adapting the latest trend in laboratory animal health monitoring programs. Dr Stevenson shared his insights on an appropriate scoring system for determining what agents and factors pose a risk to animal facilities housing genetically modified animals. The third and final session of the day covered aspects of quality control. Sue Raboczyj (UQBR) and John Swift (OHIO) explained clearly the Quality Assurance and Control requirements for operating transgenic facilities with multiple clients, and ensuring the ongoing maintenance of a growing archive of cryopreserved material. Dr. Takeo also presented the methods used to establish a robust infrastructure at CARD (Kumamoto University). The day concluded with a personal account of undergoing the NATA accreditation process from Barbara Hunt (ANU). Day 2 began with an extremely informative session on CRISPR technology. Kevin Taylor began with a talk on the introduction to CRISPR, the theory behind its evolution, the applications and advances based on his experiences at ABR in Moss Vale. Kevin also mentioned about the new refinements such as SCR7 and also briefly talked about electroporation. Fabien Delerue (UNSW) reported on the traditional methods utilised for creating knock-outs versus CRISPR/Cas9 and followed on with details of some of the projects that he is undertaking at UNSW and what he has done to refine how he carries out his projects being that he is a small outfit. Sandie Piltz’s work at the University of Adelaide is one of the pioneering Australian groups to start working with this technology, she discussed her personal experience with this methodology and what they have done to refine the technique, such as donor strains and ages, recipient strains, needle parameters, injection reagents and concentrations, environmental influences and superovulation techniques. Fiona Waters (WEHI) gave an introduction on the CRISPR/Cas9 methodology and then launched into the experiences from the WEHI team on how they have utilised and transferred their skills to this technique and the refinements they have made. Dirk Truman (APN) talked about the services that the APN provides, their efficiencies and that it is one of the first non-for-profit services offering this type of genome editing to Australian Researchers. Dirk also discussed the different species that are being used for this type of genome editing, off target effects, and what APN has done to refine the technique. The last talk for this session, Michelle Brownlee (ABR), talked about the day in the life of a microinjectionist. She discussed the strains of mice used, superovulation techniques, injection techniques, embryo transfer methods, refinements and troubleshooting. The following session encompassed the administration and training aspects of working in a transgenic animal facility. Tracy Doan (UQBR) gave an overview of the database systems used and administrative support provided to help coordinate the cryopreservation and rederivation services at the Transgenic Animal Service of Queensland. Kevin Taylor (ABR) and Keri Smith (UTas) presented their respective training programs based on structure which also opened up lively discussions on different training opportunities offered in various institutions and suggestions to meet training needs of staff members. Dr David Steele who is Institutional Biosafety Committee (IBC) Chairman at the University of Tasmania, outlined the structure and important role and function of the IBC, including dealing with GMOs when conducting research in accordance with legislation, codes of practice and licensing requirements. It is envisioned that future meetings will serve to strengthen our collaboration efforts with colleagues from various institutions doing the same type of work. AALAS, or the American Association for Laboratory Animal Sciences is hosting their 63rd Annual Meeting this fall. For ISTT members planning on attending the AALAS national meeting in Minneapolis MN (USA) in November 3-8, 2012, we would love for you to attend our panel discussion on communications between veterinarians and transgenic facility managers. ISTT members, Jan Parker-Thornberg (MD Anderson) and Aimee Stablewski (Roswell Park Cancer Institute) will be part of the panel discussion along with Rob Taft from the Jackson Laboratory and our veterinarians (Kate Naff, Linda Waterman and Sandra Buitrago, respectively). AALAS has thousands of applications for presentations so we are fortunate that ours was accepted. This is an ISTT-supported activity. Please come and participate with us. Each fall since 1950, the American Association for Laboratory Animal Science (AALAS) has held its annual National Meeting. During the five days of the meeting, members and nonmembers come together to enjoy the workshops, lectures, poster sessions, and exhibits. The program is designed to have topics relevant to the entire membership. Exhibitors have an opportunity to interact with AALAS members from the academic community, research institutions, government organizations, and commercial companies. The International Society for Transgenic Technologies (ISTT) is an AALAS affiliate organization. 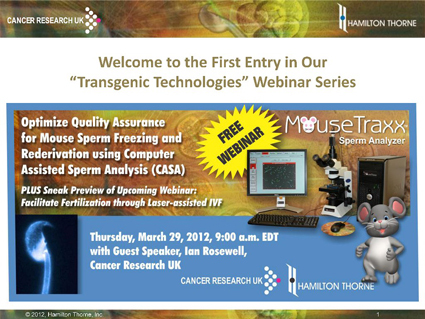 On Thursday, March 29th, 2012, our colleagues at Hamilton Thorne hosted a webinar titled: “Optimizing Quality Assurance for Mouse Sperm Freezing and Rederivation using Computer Assisted Sperm Analysis” This webinar was delivered by ISTT members, Lily Reed and Ian Rosewell as well as Hamilton Thorne’s Kate Craig. Thank you to Hamilton Thorne for your continued support for the ISTT and it’s members!